The word on the Lake was that it had been raining and hailing and thundering and lightening throughout the beginning of month. The weather had put a damper on the July 4th festivities in Tahoe. My destination was Turtle Rock Park just outside of Markleeville. My responsibility was to set up the ASJ Roadshow for the 2015 Death Ride. In addition to the threatening weather, there had been a recently extinguished wildfire south of town. As I drove up Highway 4 through the burned area and along a silty Carson River I wondered what to expect as far as turnout. But when I got the the Death Ride I recognized many fellow vendors and the expo was actually larger than memory served. A line of roadies snaked from the registration windows past our booth all the way around the corner. I passed out copies of ASJ to the waiting cyclists. The clouds above were heavy and black, but for the duration of the 9 days I spent in the Sierra no more than a few scattered drops fell around me. Saturday at 4 am the sound system broadcast Jimmy Hendrix’ National Anthem solo throughout the park. 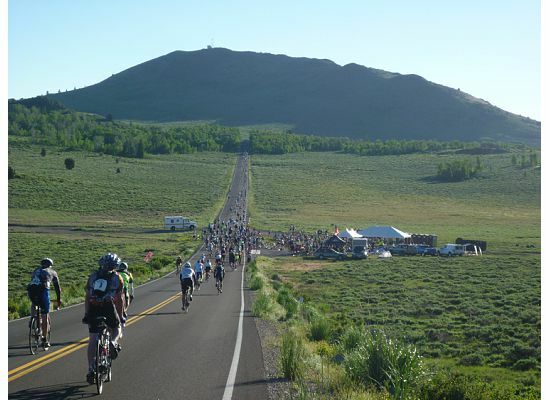 The riders would be served breakfast and then set out to attempt to climb up to 5 passes exceeding 8,000 feet of elevation. The expo would be closed until 2pm, so I got some extra sleep in my ENO hammock and read a mystery novel. I played 18 holes on the Turtle Rock disc golf course, managing to not lose any discs. I saw quite a few bloody bandages that afternoon on elbows and knees and one hanging from a woman’s cheek. The medical professionals were kept busy- it is called the Death Ride, after all. Many had qualified for the 5 pass jersey, and everyone had earned their beer. Each rider had a story to tell- something besides aching legs to bring home from the California Alps.